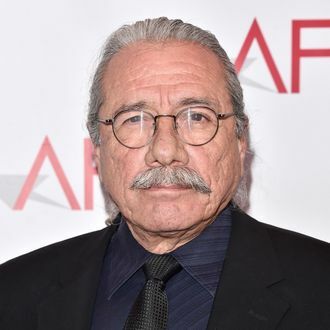 In the original Blade Runner, Edward James Olmos appeared as the enigmatic Blade Runner Eduardo Gaff who worked with the LAPD. He wasn’t in very many scenes, but he was memorable for his use of the film’s Cityspeak language, and for his tendency to leave little origami figures lying about. In a recent conversation with The Trend, Olmos talked about how he’s not allowed to talk about his work on Denis Villeneuve’s upcoming Blade Runner 2049, but then proceeded to talk about it a little bit anyway, saying his role is small but important to the plot. “It’s not about Gaff, but it’s about someone who is going to try to find out certain things about us back then,” he said. “My role is like it was in the original — that time I only had four scenes. In this I only have one. But again, it’s a poignant little scene.” So maybe the powers that be weren’t super serious when they apparently told Olmos he “couldn’t talk about it to anybody”? It’s not like he came out and said, “Gaff knew Deckard was a Replicant,” but hey, we’ve still got six months until the movie premieres, so don’t rule anything out.